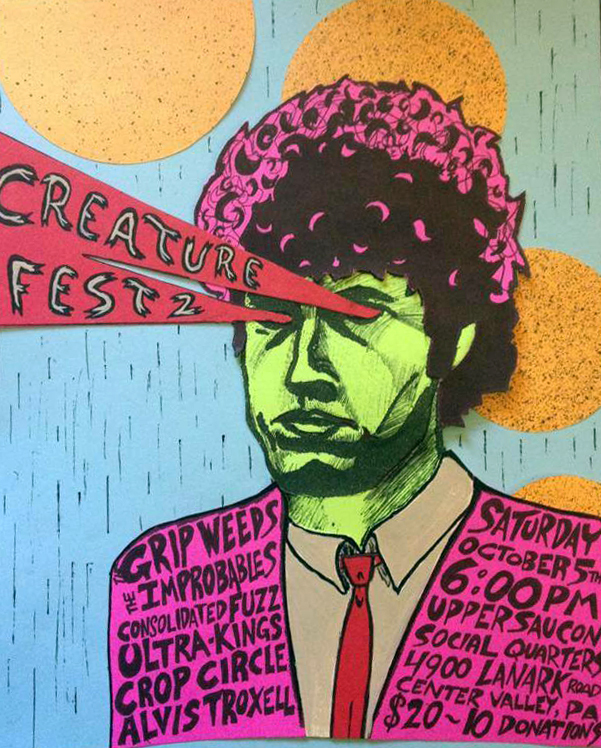 Creaturefest 2, a concert to benefit Huntington’s Disease research, will take place at Upper Saucon Social Quarters on Saturday, October 5th. The concert is in honor of Mark Smith, the long-time lead singer of Creatures of the Golden Dawn. The band was Smith’s brainchild, beginning in 1986 and taking many iterations throughout the following years. They frequented local dives like the Funhouse and became known in the LV music scene for their rock that was better placed in earlier generations. Smith unfortunately succumbed to Huntington’s when he was just 52 years old and is fortunate enough to have made a mark in the LV music scene, enough so that his legacy continues on in Creaturefest. The Grip Weeds, a Jersey band whose sound also harkens back to the 60’s, will be headlining the show. Joining them will be the Improbables, Consolidated Fuzz (the last version of Creatures of the Golden Dawn), Crop Circle, Ultra Kings, and Alvis Troxell. Admission is on a $10-$20 sliding scale and the venue will provide food until 9pm as well as a cash bar. A silent auction will also take place, with proceeds going towards charity. For more information on Creaturefest 2, check out their Facebook event page.